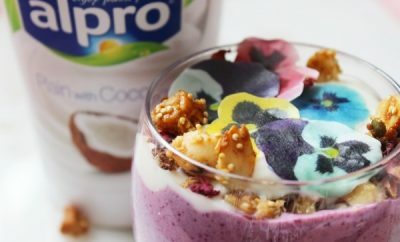 Alpro Oat Original is another one of my favourites from this fabulous brand, so I was delighted when I was asked by Alpro to create some porridge recipes using this drink. I was sent a lovely little hamper with some items to get me started with this challenge including a carton of the Alpro Oat Original. 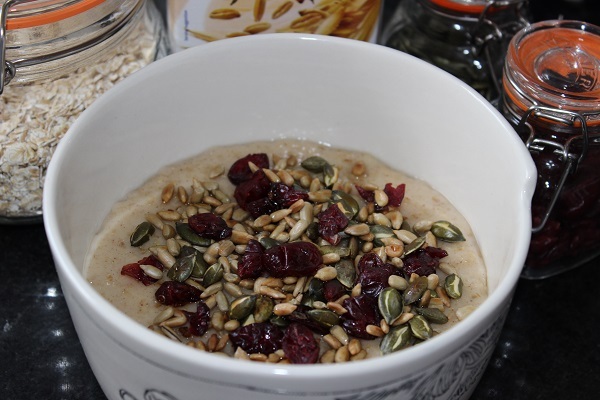 The first recipe I created was a warming cinnamon porridge, topped with toasted seeds and cranberries and a drizzle of runny honey. 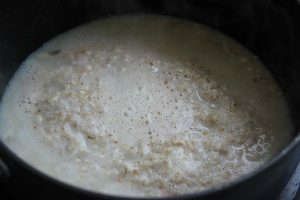 Place the Alpro Oat into a medium size saucepan with the porridge oats. Bring to the boil and then simmer for 4-5 minutes. Meanwhile toast the mixed seeds and cranberries in a non-stick pan. Place the porridge into a bowl. 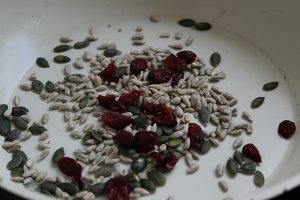 Top with the toasted mixed seeds and cranberries. 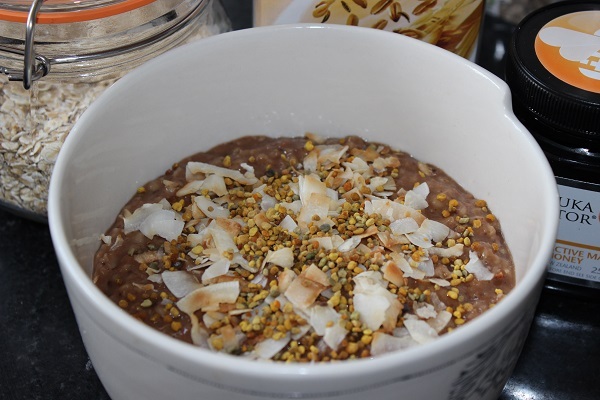 To make my Alpro Oat cacao and manuka honey porridge. 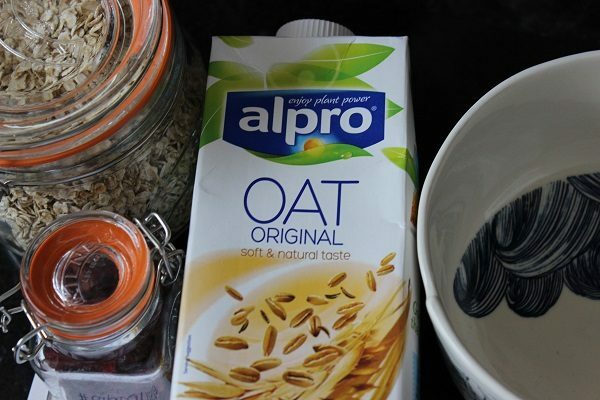 Place the Alpro Oat into a medium sized saucepan with the oats. Bring to the boil and then reduce the heat and simmer for 4-5 minutes until the porridge thickens. Meanwhile toast the shredded coconut in a non-stick pan. Place the porridge in to a boil and top with the toasted coconut. Sprinkle the bee pollen on the top. 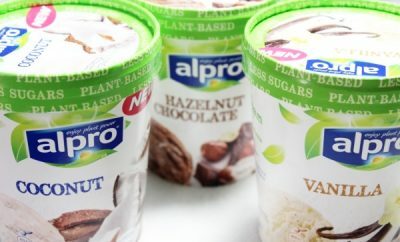 I don’t drink dairy so Alpro is my favourite and number one brand for plant based alternatives. My fridge is full of their products because I know they taste fabulous and I can pretty much use them in any of my recipes! 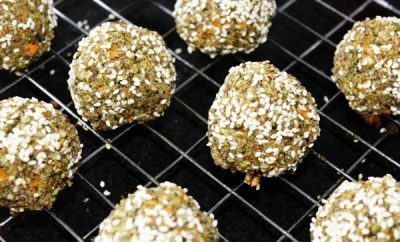 Deliciously plant-based, high in fibre and naturally low in fat. This oaty drink is also a great source of calcium and vitamins B2, B12 and D.
By mixing Alpro Oat Original with jumbo oats then adding a few healthy ingredients and toppings I know I’m giving myself the best start to the day.